There are over 2 million small businesses in Australia, employing over 7 million Australians. This represents over 60% of our workforce, yet small business is regularly overlooked by government. 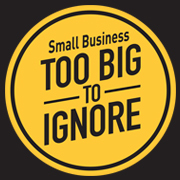 Here at Garfish, a 100% Australian owned and operated small business, we are proud supporters of the ‘Small Business: Too big to ignore’ campaign. If you’re a small business operator, if you work for one, if you care about small business or if you dream of one day opening one of your own, then we urge you to show your support at www.toobigtoignore.org.au.